Yano Research Institute (the President, Takashi Mizukoshi) has conducted a survey on the space designing industry and has found out the domestic market size, the trends of related industries, and the future perspectives. The space designing industry extends over various tasks from designing spaces for commercial constructions to comprehensive planning of large scale events, shop producing, mannequin business, manufacturing of fixtures for shops when taking charge of hardware of the shop, and interior work. Furthermore, some major companies of space designing have come to handle operational management as well as maintenance, i.e., to include property management of facilities, in addition to conventional project planning, basic designing, and interior & equipment work. On the other hand, many of some small businesses act as subcontractors of major companies or specialize in a particular category of space designing business. 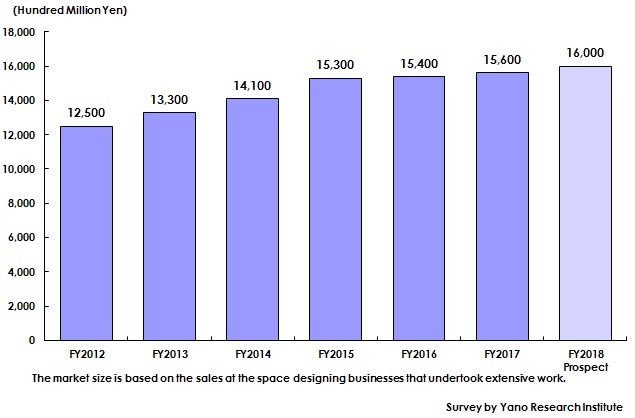 The domestic space designing market size for FY2017 (based on the sales at businesses) has been estimated to attain 1,560 billion yen, 101.3% of the size of the previous fiscal year. The demand for space designing has been invigorated in FY2017 due to relatively favorable sales performance at user companies, letting them to order some remodeling and refurbishment, and to invigorated inbound tourism demand, with increasing number of foreign travelers, which urged some hotels and other accommodation facilities to remodel. Nevertheless, within the three years since FY2015 the sales at major space designing companies have not largely improved. The clients of space designing companies are diverse from commercial and exhibition facilities, cultural buildings, and theme parks to various events. Among them, majority of the clients are commercial facilities such as department stores and specialty stores, occupying about 60% of the entire space designing demands. For the past several years, many commercial buildings and complex have been renovated, which contributed to increase the order as well as sales at many space designing companies. The domestic space designing market size for FY2018 is projected to achieve 1,600 billion yen, 102.6% of the size of the preceding fiscal year. Each market player in the space designing industry has focused conventionally on the designing of various facilities, interior works, planning of events or exhibitions, and other supportive construction works. In addition to such works, many such businesses have started engaging in operations and maintenance of the facilities that they have completed the construction works, aiming to acquire stable profits. Furthermore, they have begun pursuing further growth to acquire new customers and to develop new constructions that do not belong to any commercial facilities, while securing the business of conventional events and facilities. Because hotels are needed to newly built and remodeled to prepare for increasing number of foreign tourists and for the Tokyo Olympic and Paralympic Games in 2020, the demands of space designing is likely to continue being strong at least until 2020. The market players also pay attention to designing of offices to respond to Working-Style Reform led by the government. The market size in this research has been calculated based on the sales at the space designing businesses that handle extensive work and tasks.